It is difficult to deny the enormity of space and the cosmos, the scale of which can make one feel immensely small—yet at the same time can fill one with a deep sense of wonder at it’s magnitude. As Carl Sagan described, “our planet is a lonely speck in the great enveloping cosmic dark.” Despite the grandiosity of the space that surrounds our small planet, we continue to seek deeper meaning and to unravel the mysteries that have puzzled us for generations. Although our knowledge of our planet, our solar system, and our galaxy has grown exponentially, we still have a ways to go. Oumuamua—whose name is pronounced “oh-moo-ah-moo-ah” and is a Hawaiian word that translates to “a messenger from afar arriving first”—is the first known interstellar object to travel through our solar system. The discovery of the object was first made on October 19, 2017, by the Panoramic Survey Telescope and Rapid Response System (Pan-STARRS) located at the Haleakalā Observatory in Hawaii. Since then, telescopes around the world, including the space-based Hubble and Spitzer telescopes, have answered the call to assist in measuring, tracking, and recording the object as it traverses an observable path through our cosmic backyard. At first, the object puzzled scientists; its rocky and elongated shape was unlike any asteroid or comet observed in our solar system in the past. It was first classified as a comet but then soon recognized as a type of asteroid, its unusual nature even pushing the International Astronomical Union to adopt new designations when it comes to identifying objects of interstellar origin. Further, Oumuamua represents a new type asteroid classification. Known now as a “hyperbolic asteroid,” Oumuamua is classified as such due to its hyperbolic orbit, which will ultimately take it back out of our solar system and toward the constellation Pegasus. For astronomers and space researchers, the opportunity to observe this object provides an immense amount of potential to learn more about the formations of other solar systems. Looking at current orbital calculations, it is believed that Oumuamua traveled to our solar system “from the approximate direction of the bright star Vega, in the northern constellation of Lyra,” according he NASA release. 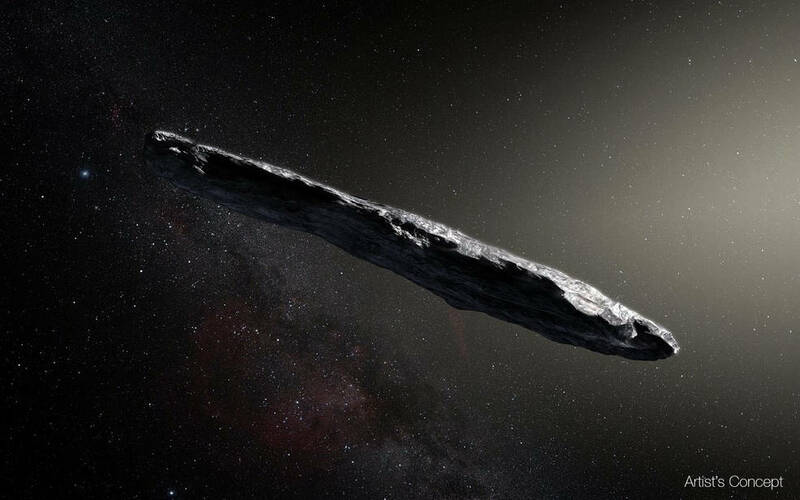 However, “it took so long for the interstellar object to make the journey—even at the speed of about 59,000 miles per hour (26.4 kilometers per second)—that Vega was not near that position when the asteroid was there about 300,000 years ago.” More recently, in late November, Oumuamua has since been observed “travelling about 85,700 miles per hour (38.3 kilometers per second) relative to the Sun. Its location is approximately 124 million miles (200 million kilometers) from Earth—the distance between Mars and Jupiter—though its outbound path is about 20 degrees above the plane of planets that orbit the Sun.” It will make its way out of our solar system as it passes beyond Saturn’s orbit in January 2019. Since the initial observations of Oumuamua, we’ve witnessed a continuous stream of new information and theories regarding the object’s makeup and origins. After some initial teasing that the object could be investigated as if it were a spaceship of some kind, researchers have now come to the conclusion that, while Oumuamua is definitely not a spaceship, its exterior may not be too dissimilar from the exterior hull of one. According to new research published in the journal Nature Astronomy, the asteroid could be harboring a water-ice core protected by a dry, carbon-rich crust. While there is no definitive proof that it currently contains ice or water, spectral observations from a team of researchers led by Queen’s University astronomer Alan Fitzsimmons suggest the object could have been icy a long time ago, as it exhibits certain similarities to “organically rich surfaces” found in the outer parts of our own solar system. Oumuamua is a rare find for scientists and researchers that will no doubt continue to provide a wealth of information for years to come. As the object wanders through our cosmic neighborhood, the data that has been and will be acquired will hopefully give us a hand in unraveling some of the mysteries that we’ve strived to investigate ever since we first looked up at the stars—and with that, a tiny snapshot of the resplendent magnificence of the universe.